The Black Sea city of Sochi has been a popular Russian resort area for nearly two centuries. Located approximately 1,500 miles due south of Moscow, the city is famous for its favorable climate, beautiful landscapes, beaches, parks, health resorts, spas, and hotels, as well as mineral springs, which have prompted the development of spas, such as the renowned Matsesta. Tourism is the leading industry of the city and provides growth for other sectors, such as health care, hotel services, construction, restaurants, and food processing. During the last decade, the popularity of Sochi has waned as Russians, granted new travel freedoms, began vacationing abroad. However, as a result of the economic crisis that began in 1998, including the devaluation of the ruble, Russians have redirected their attention backto the area. During summer 1999, the number of visitors registered at hotels, health resorts, and other facilities reached 1.5 million, up from 569,400 in 1998. However, the city does not offer an adequate supply of high-quality restaurants, hotels, and leisure attractions to meet the great demand. Sochi is accessible by air and sea. It has an international airport that offers air connections with most major Russian cities, as well as Western Europe, through Moscow. Currently, a new modern terminal is being built to extend the airport's capacity. Modern airport management, as well as funds to complete construction, is needed to finalize this project. Sochi's seaport provides a direct sea connection with Turkey, Greece, Georgia, and Ukraine. A new trading port in Sochi is currently under construction. Tourism is the most promising and developed sector in Sochi. Visitors are attracted not only by the pleasant summer weather and Black Sea, but also by skiing and sports competitions and other attractions, business events and trade fairs, and health spas and medical treatment centers. Although most tourists flock to the city in the summer, the winter season also attracts skiers to the Krasnaya Polyana resort, which was founded by Alpika Service. The firm, which constructed ski tracks and provides equipment rental, instruction, and ski lifts, is currently seeking partners or investors to help expand the complex into a high-quality, all-season tourist complex with hunting, fishing, and mountain climbing. A candidate to host the 2002 Winter Olympic Games, Sochi hosts many sports competitions that attract thousands of athletes and spectators each year. Sochi has some 200 hotels and sanatoria (health spas) that offer a range of services and standards. 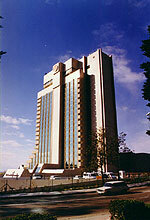 Among the best hotels are the Radisson SAS Lazurnaya and Dagomys, both owned by Russian gas monopoly Gazprom. Another four-star hotel also run by Radisson, the Lazurnaya Peak, is located outside the city center at the Krasnaya Polyana ski resort. Several of Sochi's sanatoria are located in centuries-old villas, all in need of renovation and interior modernization as well as improved hospitality management. The most striking such sanatoria are the Ordzhonikidze, Rus', and Sochi. Many sanatoria and hotels were built in the second half of the 20th century, with modern architecture. During the Soviet era, they belonged to different large Soviet organizations that sent their employees to Sochi for vacations. Now all sanatoria are privatized. Many of them are partly renovated and receive visitors throughout the year. For example, hotel Zhemchuzhina (Pearl) is gradually renovating its rooms to international standards. Zhemchuzhina's management seeks an investor for further renovations and preparations to acheive international certification as a four-star hotel.